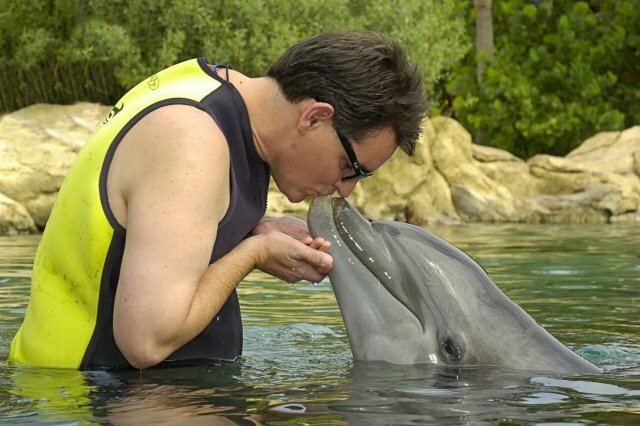 For my birthday this year, Bobbi took me away for the weekend to Discovery Cove in Orlando. If you've never heard of Discovery Cove, it's a park where you get to swim with dolphins. It's very expensive because they only allow 1000 people a day inside the park each day and everything you need is included. They have a huge winding river to float down, big ponds full of fish and manta rays you can snorkel in, food, drinks, towels, showers, everything you need (and the food is good stuff like Oreo's and Budweiser at the snack bars and salmon, chicken, etc. for lunch). I can honestly day that it was worth the money as a once-in-a-lifetime day. I was really worried that I would be disappointed but it didn't turn out that way. Shortly after arriving we were walking by the dolphin lagoon and there was a guy being pulled by a dolphin. I turned to Bobbi and said, "I'd gladly pay $100 just to be able to do that." We had heard that we wouldn't get a dolphin ride and I assumed that what we saw was a person who had paid for the even more expensive "trainer-for-a-day" package. We were wrong. Our dolphin's name was Scarlett and she is a former performer at Sea World. Our trainer was very cool and answered any questions we had. After having my picture taken I asked, "We saw a guy getting pulled earlier, is that part of the "trainer-for-a-day" package?" "No," He said, "You'll get to do that." It wasn't until that point that I finally stopped thinking about how much the whole thing cost. After the pictures he had us swim out to the middle of the lagoon and Scarlett brought us back. It really is a great feeling after watching dolphins your whole life to actually get down in the water with them. Besides the ride, you get to touch then and make them do tricks and jumps right in front of you. As a matter of fact, you can hang out in a beach chair on the sand right in front of the lagoon all day and watch the dolphins doing flips and such. After the dolphin encounter we had lunch and then went to the aviary. The most beautiful birds you've ever seen land on your arm and eat from your hand. Then we took a relaxing float around the park and finally sacked out with some drinks in a big hammock in the shade. One of the great things about the park is that the landscaping is so great that you really feel cut off from the outside world. It's really beautiful.